There are two hand winches. 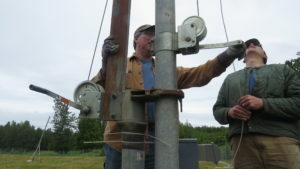 One brings the mast to vertical, and the other one extends the mast upwards. It’s obvious when you are on the trailer, but not so much in these pictures. The cable reel is mounted on a two wheel hand truck, so it can be moved around without too much work. There is a divider on the reel. When there is only one cable on the reel, about 80% of the cable is on one side, and 20% is on the other side. 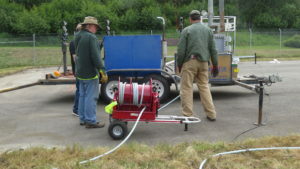 Before you can remove the cable, you must release the brake on the reel. 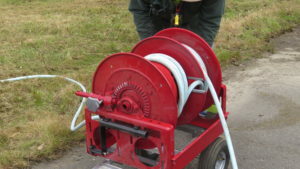 You can remove cable from the reel either by pulling on the cable, or having someone hold on to the cable and pulling the reel away from the free end of the cable. The trick comes when you get to the last 40% or so of the cable. There are two cable ends, and you have to pull on both ends of the cable to un-reel them. There must be a good trick to position the reel in the proper place to un-reel the cable ends in both directions. But we don’t know that trick. 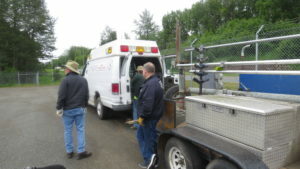 The overall dimensions of the trailer is approximately 8 feet wide by 20 feet long. The bed of the trailer is 6′ by 15′ 2″. The ‘A’ frame in front is 4′ long. The mast hangs off of the back of the trailer by about 8′, so counting the mast hanging out the back, the trailer is about 28′ long. It is less than 8′ 4″ high. 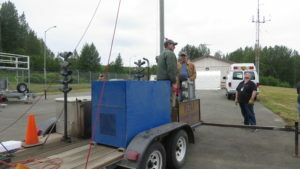 We have a 12 KVA generator with about 90 gallons available in the external tank. 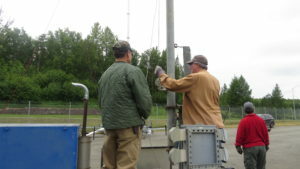 The mast is mounted about 16″ from the front of the trailer bed. 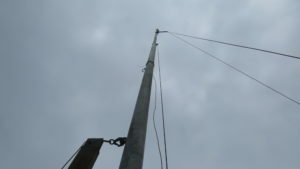 The mast is about 20′, plus another 20′ when cranked up. There is a rack for carrying long thin things like antenna elements, and there are 10 spaces available on the rack. 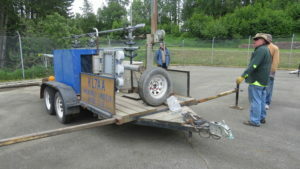 The trailer has dual axles, keep the tires at 50 PSI.